The seven cheeses (and a few extra) presented here are a bit more unusual than brie, cheddar and some of the other cheeses commonly encountered on a cheese plate. You should feel free to pick the ones that appeal and combine them on a plate or board with some of your favorites. 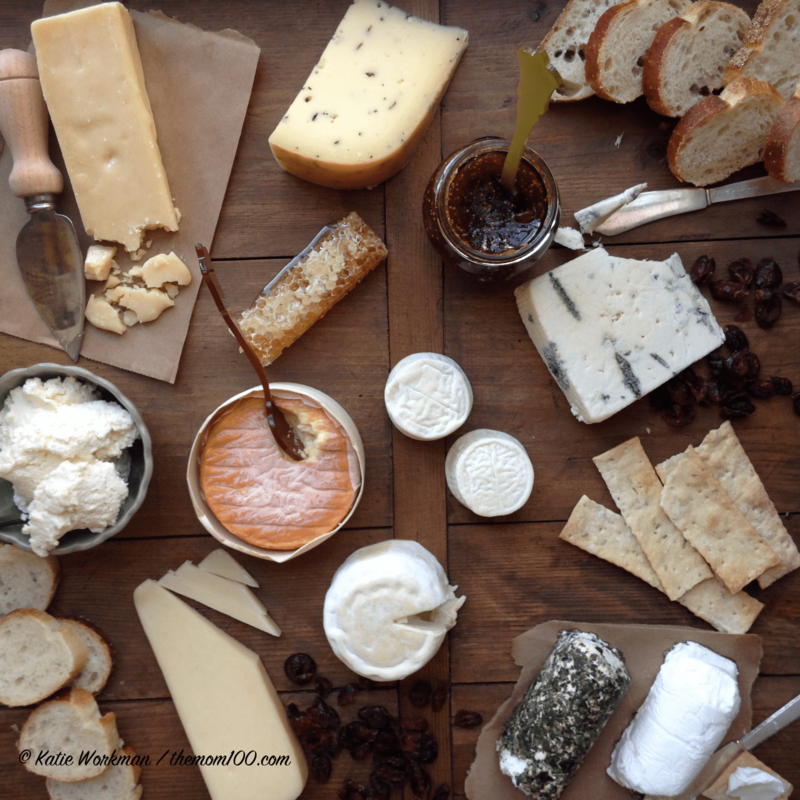 The best thing about making cheese assortments is that you can constantly shake things up. So popular now, the classic flavor characteristics of chevre are a fresh goat milk taste, mild flavor, and smooth texture. Try it with a drizzle of honey, or maybe some fig jam, on a cracker or slice of baguette. The plain is always a hit and it’s nice to offer the pairing of a plain log with an herb-coated one for variety. Beautiful little buttons of ripened goat cheese, or “crottin” are adorable and showcase the distinctive flavor of goats’ milk perfectly. These are called Bijou, from Vermont Creamery, and they are dried and left to mature for a month, resulting in a slightly sweet yeasty flavor. Coupole is another aged goat cheese from Vermont Creamery, who is one of the best goat cheese makers in the U.S. Made in the French style, this American original has a dense texture and fresh milk taste. The strong ripened flavor of the rind is markedly different than the delicate fresh taste of its interior. Affidelice is slightly smaller than its popular sibling, Epoisse Berthaut, but a bit less pungent. Affidelice is washed in Chablis instead of marc. When brought to room temperature and ripe it is soft and spoonable, with a concentrated richness and a creamy texture. This cheese is made from raw cow’s milk, but what makes it amazing is that just prior to the pressing and shaping of the cheese, shavings of Italian black truffles are generously sprinkled throughout the curd. This is a showstopper cheese perfect for holiday entertaining. You may think you know ricotta cheese, and you may think it’s not so interesting to eat on its own. Well, this ricotta is smoked over wood and is incredible smeared over a piece of bread or a cracker, maybe with a few fig preserves. People often think about Parmesan for grating and cooking, but its wonderful eaten on its own, served with a wedge knife to chop off little crumbly chunks. The nutty, salty flavor explodes in your mouth and is lovely with a slice of apple or pear. A simple cow’s milk cheese is always good to include on a cheese platter for those with milder palates, especially many kids, or just for a quieter moment amongst more pungent cheese. The smooth texture and gentle but still rich flavor of fontina make it a consistently good choice. Sharp, usually salty, sometimes a bit sweet, the powerful flavor of a blue cheese really rounds out a good cheese plate. They are usually a little stinky, but most serious cheese lovers really go for that. Fig jam feels pretty gourmet, but it’s now available all over the place. Other jellies and jams make a nice sweet counterpoint to cheeses, be they rich, creamy, crumbly, pungent or mild, but there’s something about the fig jam that really works. Completely raw and unprocessed honey comb is so pure tasting. Drip it over various cheeses.